Navigate to your staff directory and locate the staff member you would like to add a bonus for. NB: Alternatively, you can type their name into the search bar at the top of your screen. 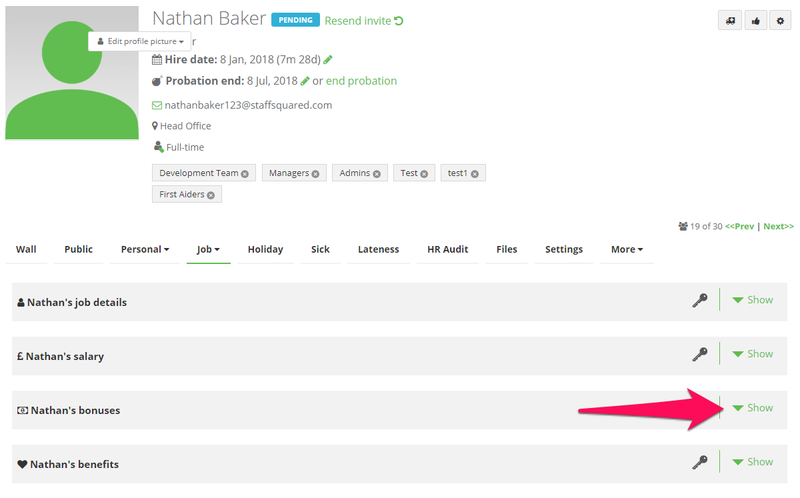 Once you are on the staff member's profile, navigate to their Job tab and scroll down until you see name's bonuses. Click show to access their bonuses information. This will bring up any past bonuses for that particular employee. Click + add bonus to apply a new bonus to the staff member. This will prompt a new dialog box to appear which will allow you to enter an amount, currency and start date . Once you are happy with the information you have entered, click Add. 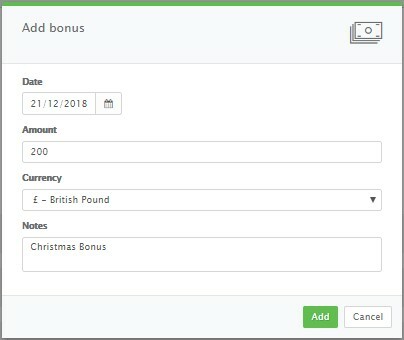 The new bonus will then appear in the list in date order. To delete a bonus, click on the red cross. Clicking this option will prompt a new dialog box to appear, asking you to confirm that you want to continue with this action.